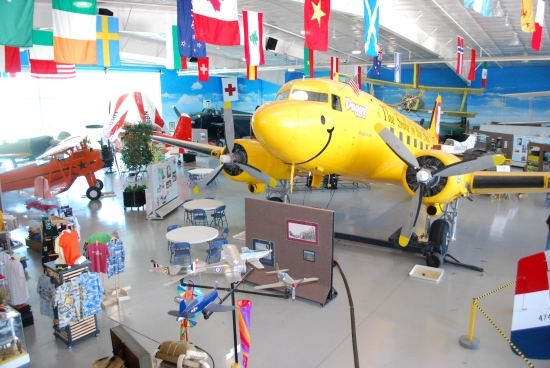 Fargo, North Dakota is home to today’s “Museum of the Day,” the Fargo Air Museum. I’ve been getting things set-up in my new home in Washington, D.C. and apologize to my dedicated reader for the delay in posting new museums to this blog! After a short hiatus, “Museum of the Day” is back with a great little air museum in the Mountain-Plains region of the U.S. The museum showcases historic non-flying aircraft and engine exhibits. An EAA 317 Wright flyer replica, Pitts Special, ME 109, Huey helicopter, Iskra Jet, DC-3 and other historic aircraft. Aviation and military exhibits range from the North Dakota Wall of Aces, Carl Ben Eielson, Charles Lindbergh, the Golden Era, air racing, Tuskegee Airman and more. In the late 1990’s, a group of local military folks, agriculture pilots and international Warbird restorers were at the Fargo AirSho. After the show they realized there was a wealth of historic aircraft, knowledge and a passion for aviation, education and restoration. The founders developed the mission statement, developed a three-building long-term plan and opened the museum’s first hangar in 2001. In 2008, the organization retired the debt on the first building and plans are now in play to build the next two buildings. The Fargo Air Museum founding members believed in the vision of creating a premier flying museum in the Upper Midwest. The vision and the dream included a long-range plan to build a series of three buildings. The museum first established themselves as a 501(c)3 non-profit organization and set forth to raise funds through charitable giving contributions. The first building Wing was completed in 2001 and serves to showcase flying Warbird airplanes and Building Wing II will be devoted to education and traveling flyable aircraft exhibits. The third building will be devoted to the interpretative education entrance with a library, multi-media center and interactive exhibits. I’m always excited to see smaller, more rural museums with great content and an engaged community to help make the museum a more significant institution of learning. Hopefully, one day, I can see this museum in Fargo.